Tiger shrimp sauteed with lemon garlic sauce, diced tomatoes and choice of pasta. Creamy white alfredo sauce served over fettuccini. Add chicken for $3. Add shrimp for $4. 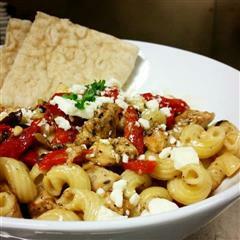 Cavatappi pasta, kalamata olives, roasted red peppers & feta cheese in a garlic butter sauce. Add chicken, shrimp, or pepperoni for $2 more.